Dr. Warren’s blogger articles on executive functioning. I’m so pleased to announce the release of my new Publication: Executive Functioning Game: In or Out! It is the first of a series of executive functioning games that I have been creating over the past six months. All 30 cards include two images: an inner image and an outer image. 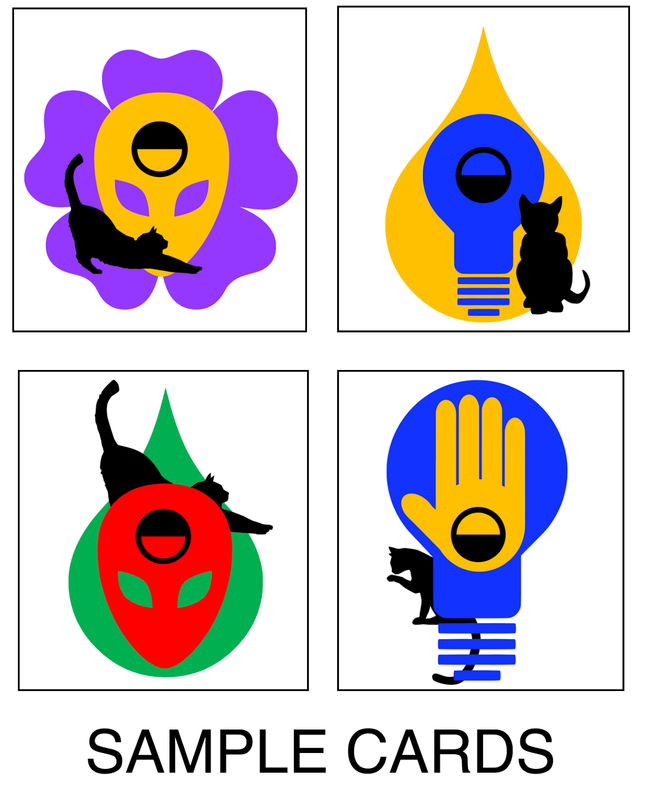 There are six images: a car, a light bulb, an alien, a raindrop, a flower and a hand. In addition, there are five different colors: yellow, red, blue, green and purple. It is a complex matching game that requires players to remember and utilize rules to search for commonalities amongst cards. The black symbol in the middle of the inner image directs players to look at the inner image or the outer image. Then players compare cards from their deck to the image in the discard pile. The black cat is simply a distractor and has no other purpose in the game. What Population of Learners Does This Serve? In or Out is a fabulously fun game for anyone, but it also serves as a cognitive, remedial tool that strengthens executive functioning skills: working memory, attention to detail, management of distractions, stamina, response inhibition, as well as mental shifting and sustained attention. For remedial purposes, this game can benefit individuals with ADHD, learning disabilities, executive functioning disorder as well as those with head injuries and the elderly. Initially, I play the game with my students and verbalize the process. I slowly scaffold the process over to them. Once they have it, we play against one another. The game is presently available @ Good Sensory Learning as a digital download. I am looking into printing decks of cards, and they will eventually be available on Amazon. Can you imagine trying to learn in a classroom all day while being bound in a strait jacket? For many kinesthetic learners as well as kids with ADHD, requiring them to sit still during instruction is quite similar to binding them in their chairs. Although some learners do benefit from sitting motionless, for others it is almost impossible to learn while their bodies remain idle. It makes sense that one would teach in a way that they, themselves, learn. As a result, most teachers reflect upon their own ways of processing information when they create their lesson plans. I have found in my many years of conducting workshops with teachers, that very few teachers personally find movement helpful with the learning process. In fact, I have my own theory that teacher education does not attract many kinesthetic learners, as the process to become a teacher requires little to no movement. This hypothesis was tested when I conducted a workshop at a private middle school and high school. When I assessed the learning preferences of the entire 200+ faculty, I was amazed to learn that only one of the teachers reported that they were a kinesthetic learner and that movement helped them to learn. When I asked them what subject that they taught, they replied, “Gym.” Because the majority of subject-based teachers in middle school and high school don’t find movement helpful in the learning process, and often find it distracting, one can understand how difficult it can be to find teachers that are comfortable accommodating students that need to move around while learning. 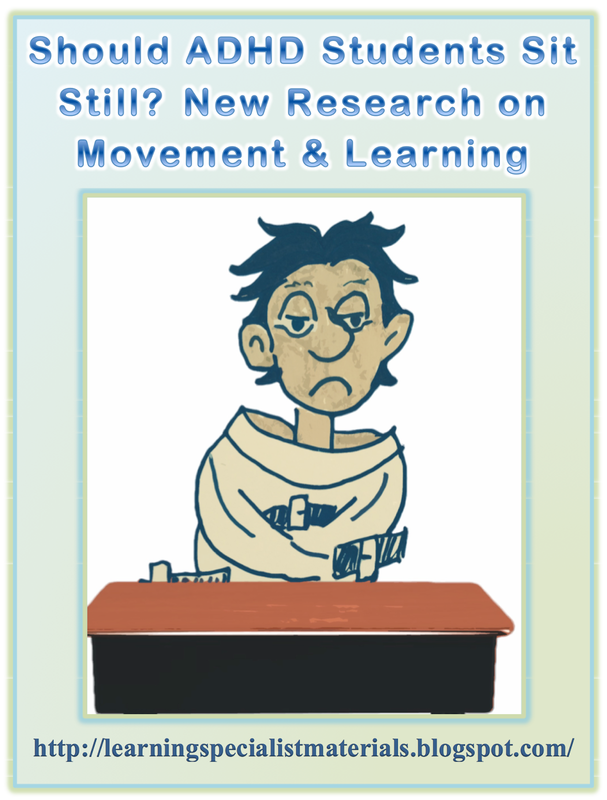 What Does the Research Suggest About Movement in the Classroom? New research that was recently published in the Journal of Abnormal Child Psychology indicates that physical motion is critical to the way that students with ADHD encode and retrieve information and solve problems. Dr. Mark Rapport, a psychologist at the University of Central Florida conducted a study that was published this April, 2015 in the Journal of Abnormal Psychology. The article, entitled, Hyperactivity in Attention-Deficit/Hyperactivity Disorder (ADHD): Impairing Deficit or Compensatory Behavior? indicates that movement aids working memory and attention for boys ages 8-12 with ADHD, while these higher levels of activity resulted in lower working memory for typically developing students. This indicates that the hyperactivity for students with ADHD has a functional role. It would be nice to see more research that looks at the needs of other kinesthetic learners that don’t have ADHD. They do exist, as I have worked with quite a few of them myself. How Can We Accommodate These Kinesthetic Learners in the Classroom? Clearly, motor activity is a compensatory mechanism that facilitates neurocognitive functioning for kinesthetic students as well as those with ADHD. Therefore, instead of requiring students to sit motionless in their chairs, schools need to offer students the option of sitting on ball chairs, integrating adjustable desks with foot swings that give the students the option of standing, and integrating desks with exercise equipment. In addition, these students need to be coached on appropriate and non-disruptive ways that they can move in the classroom, and teachers need to be educated about the benefits of movement for many students. Personally, I love to integrate movement into my lessons for those that need it. It’s amazing to see how engaged and motivated students can become when they learn in a way that nurtures their best ways of processing. Here are some links to some of my favorite kinesthetic tools for the classroom! If you would like to assess the learning preferences of your students and uncover the kinesthetic learners in your classroom, consider learning more about my Eclectic Teaching Approach. This publication also comes with an assessment that will help you define the unique ways of learning for each of your students, so that it is easy to accommodate and empower them. Set an example. Use a planner and create a structured routine for yourself and use labeled boxes, shelves and filing systems so that everything has it’s place. Praise self initiation. In the beginning, rewarding kids for executive functioning skills will provide greater motivation. Organize time and post schedule around the house or classroom so that a daily routine can be established. Provide structure by offering a lot of support in the beginning. Do the process together and slowly pull away as the needed skills are acquired independently. Give reminders and help students come up with systems so that they can remind others as well as themselves. Use calendars. Show the different calendar options to students and let them pick their preference. Some students need to see the “big picture” and may prefer a month or two at a glance, others may choose one or to weeks at a time, and then there are those who like to manage one day at a time. Checking and maintaining these calendars at allocated times on a daily basis is important. Stay calm and supportive. Maintaining a mindful and peaceful demeanor will help to create a “safe” environment where students can learn from their mistakes. Avoid negative labels such as careless or unmotivated as it will only create negative energy. For many, name calling will make children feel helpless to the point where they stop trying. If you are looking for a publication that offers a large selection of materials that help students with executive functioning skills, CLICK HERE. Students that struggle with ADHD battle maintaining their focus on classroom materials and can be a challenge to hook and reel in for any teacher. Many teachers and parents ask me to help them address what is best for ADHD learners, and the magic for motivating and enticing these students falls into five realms: the learning environment, the teaching approach, the teachers presentation, mindfulness training and the assessment of learning method. The Learning Environment: Create an engaging, multisensory learning environment that offers fun learning tools. Offer hands on experiences and consider creating learning stations where students can complete a variety of activities that reinforce lessons. Offer a variety of seating options. Some students learn best when sitting still, while other students need to move around. Options, such as the Zenergy Ball Chair, stand up school desks and bouncy bands offer opportunities for students to move without distracting their classmates. Play games that preview or review lessons. This will bring the fun factor into the classroom. Make sure that the lighting is optimal for all learners. Make sure that there are minimal auditory and visual distractions. The Teaching Approach: Use teaching methods that are empowering for all learners. Go multisensory: Teach to each of the 12 ways of learning, while assessing and accommodating your learners best ways of learning so lessons can be most empowering. To get an assessment and manual on meeting the 12 ways of learning, CLICK HERE. Make the lesson playful. If you are not sure how to do this, create a suggestion box and let your students offer ideas. Go creative and integrate art and music into your lessons. The Teacher’s Presentation: Be enthusiastic and positive when presenting your lesson. Create excitement or intrigue on class topics. For example, encourage your students to dress like the historical characters they are learning about, create a game for a lesson and let the students know how fun it will be, provide examples on how a coming topic is used in real life, and invite engaging professionals to share their experiences to the class. Come up with a fun name for all lessons. Instead of introducing a lesson with a dull and boring name, come up with a title that sounds fun. For example, don’t teach script or cursive, teach roller-coaster letters! Be positive in your presentation. Stop using negative labels and replace discouraging comments with words of encouragement. Click here to learn more. Mindfulness Training: Teach your students to manage and be aware of their own thinking process. Determine if your students are passive or active learners and help them become conscious learners. Here is a free assessment you can use with your students. Lead a discussion with your students about on how to maintain focus. See what strategies your students are already using and suggest metacognitive approaches and visualization strategies. Share your own metacognitive techniques on how you focus. You can do this by sharing your internal thoughts. Ask your students to think about the material and make connections to their own lives. Assessment of Learning Method: Maximize the utility of classroom and home work assignments. If you want to assess your students knowledge of a topic through class and homework assignments, provide 3 to 5 different options that tap into the different ways of learning. Make sure all homework and classwork is valuable and engaging. Allow students to get partial credit for errors on classwork, homework and tests so that they can learn from their mistakes. I hope you found this blog helpful. If you have any other ideas, please share them below this blog. With the new academic year around the corner, teachers, parents and students need to begin planning for the new school year. But what most teachers and parents don’t know is that the part of the brain that assists with planning, time management and organization is not fully developed until students reach their early twenties. Therefore, for most young learners, adults need to help create a structured plan and provide assistance when prepping, and gathering materials for school. Checklists, graphic organizers, step by step procedures, strategies and more are often required, but many adults are overwhelmed with other responsibilities, and it can be difficult to find the time to take on this role. incentives programs. Finally, I offer a free video on executive functioning. I hope you find this post helpful. If you have any questions or thoughts, please leave a comment. to develop until around 20 years of age. break the task into manageable chunks. how you plan and manage your own time. for students to plan their approach in small groups. a plan and stick to it. students to estimate and discuss the total time they expect to spend on a project or assignment. Break assignments or projects into manageable tasks with clear expectations. each task a goal, a start date and a deadline date. goals in a planner and/or on a family calendar. Helps students create checklists and encourage them to check off completed tasks. Many young learners are being diagnosed with executive functioning weaknesses and schools are struggling to meet the needs of this population of learners. The problem is that many teachers and administrators don’t understand the difficulties associated with this problem and therefore find accommodating these students an ever increasing challenge. The cognitive process that connects learned experiences with present actions. The place that encodes, retrieves and manipulates information. What is the Impact of Executive Functioning Difficulties? What are Some General Solutions?